These are our Affiliates we use them so we also recommend them . Here is a special Affiliate. To help with all your needs from kids to grandparents and even the disable!!! 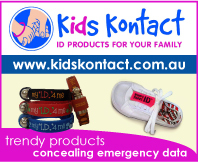 supplier of Allergy Alerts, Bike Safety, Child Tracking Devices, Pets, Sport, Travel I.D. Kits of all descriptions, Low cost Wristbands, Medical Wristbands, Mummy Hook, Personalized name bracelets, Pool Alarms and more !!!! !